Rule on the court with powerful shots with the Dunlop Apex Infinity 3.0. This model from the Apex line is the lightest of all Dunlop rackets. The frame weighs only 115 grams and feels exceptionally light due to the head light balance. Because the most weight is in the bottom of the Dunlop Apex Infinity 3.0, it is very manoeuvrable and makes it easy to volley and attack. With this racket, you can alternatively choose to hold your shot and still generate sufficient power with a short swing. The Dunlop Apex Infinity 3.0 has a spacious teardrop-shaped racket blade of no less than 500 cm2. The strings can move up and down more freely due to the longer length strings, and this provides a lot of power. Because the strings run in a fan shape, there are two strings coming out of each tubing in the bottom of the racket. The Dunlop Apex Infinity 3.0 has a large sweet spot (= the ideal place to hit the ball). This means that you can control the ball even if you hit it closer to the frame. An aerodynamic layer has been applied onto the outside of the frame, which means that the Dunlop Apex Infinity 3.0 has significantly less air resistance. This layer, called Aeroskin CX, has been inspired by sharkskin. The ripple structure creates local turbulence and the air resistance is reduced by up to 35%. It feels like the Dunlop Apex Infinity 3.0 just “cuts” through the air, as it were, and you can effortlessly generate a lot of racket acceleration for hard shots. Vibrations caused by the impact of the ball are kept to a minimum by the HM6 carbon construction. The frame of the Dunlop Apex Infinity 3.0 is made of 'high modulus' carbon fibres that have a hexagonal shape. Vibrations are better absorbed and distributed over the entire racket, making the Dunlop Apex Infinity 3.0 incredibly solid during a shot. The Dunlop Apex Infinity 3.0 is an ideal racket for an active recreational or competitive player who is looking for an ultra-light, highly manoeuvrable racket with a lot of power. The racket comes with a nice squash ball shaped dampener. 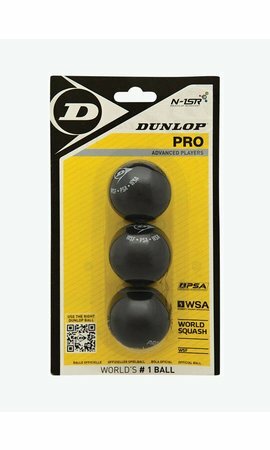 In addition, there is a full-size cover included in which you can safely store the Dunlop Apex Infinity 3.0 after your match or training session. This cover has an adjustable shoulder strap.